This is the legacy way of configuring VTP pruning. VTP pruning spares bandwidth and adds to security by paying attention to what switches have interfaces assigned to VLANs. If a switch isn’t using a particular VLAN, the VTP server will block traffic from the VLAN going to that switch. In the below example we will turn on VTP pruing for SW1. 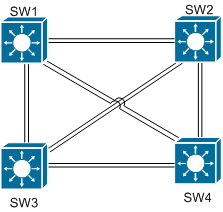 On SW2, we can see that Fa0/9 and Fa0/12 are in VLAN 11. After that, we turn on switching for SW1. Looking at the show interface trunk output, we can see that Fa0/23 is allowing VLAN11 traffic. Checking show cdp neighbor on SW1, we see that Fa0/23 is connected to SW2.